Aircraft wings are subject to different conditions during flight, but until now rigid wings weren’t optimal for any of them. A team of researchers led by NASA and MIT in the US have come up with a radical new aeroplane wing design that is not only much lighter than conventional wings, but also has the potential to automatically reconfigure itself to meet the flight conditions of the moment – just like birds do when they’re in mid flight. Built out of tiny, identical polymer tiles connected by struts, the new mechanical metamaterial promises faster, cheaper aircraft production and maintenance. Airplane wings are complicated structures that are expensive to design, build, and maintain. In order to do their job, they require an intricate system of control surfaces, motors, cables, and hydraulics to function so that a rigid wing can use rigid control surfaces that slide and tilt to control the flow of air passing over them. The problem is that such rigid surfaces are nowhere near as efficient as they could be. Worse, every wing is a compromise – not with an ideal wing, but between an entire series of ideal wing shapes that would be needed to provide the best performance while taking off, landing, and every other flight condition in between. This a major reason why aircraft are so expensive to build and also why their design is almost invariably the sub-optimal one of a pair of wings stuck onto a tube. 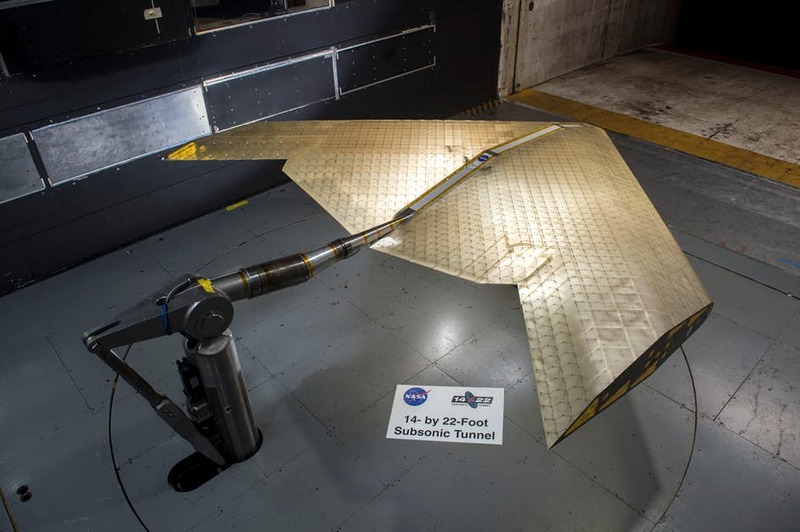 However, the NASA-MIT team have now produced an alternative in the form of a morphing wing, and while the idea isn’t new, after all, the very first Wright Flyer in 1903 used a morphing wing for controls, the idea to build the wing out of tiles in the form of tiny, identical, hollow, rubber-like polymer cubes, triangles, or other shapes made up of matchstick-size struts along each edge, is. These can be bolted together to form an open, lightweight lattice framework that is covered by a thin layer of a similar polymer as a skin. According to MIT, “the result is a mechanical metamaterial that has the same stiffness as a conventional wing, but the density of an Aerogel,” where Aerogels are a category of materials I’ve discussed before with an amazing array of properties that, among others, make them ten times stronger than steel but 99.8 percent lighter and amazing insulators. In terms of numbers, that means reducing the density of rubber from 1,500 kg per cubic meter down to 5.6 kg per cubic meter, something that not only makes the wing much lighter, but also makes it capable of reshaping itself to meet different flight conditions. The clever bit though is that the design can be made even simpler and lighter by removing the need for complex, heavy actuators and cables to do the reconfiguring. 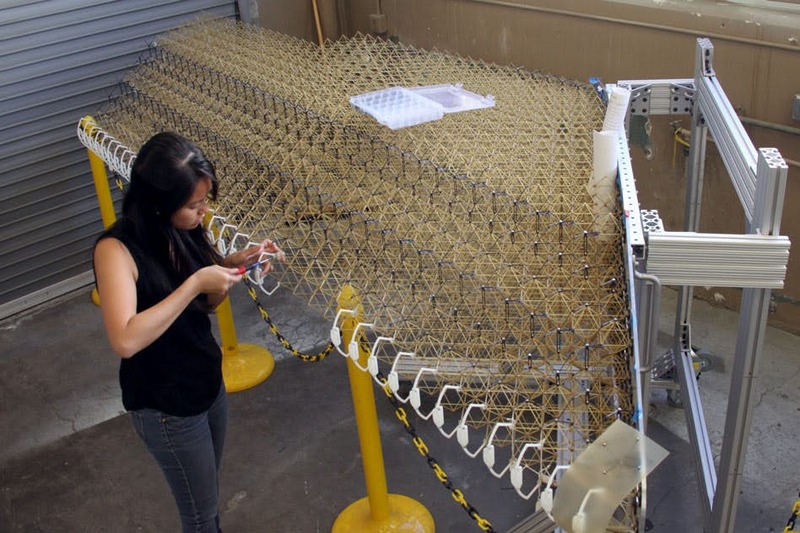 The team says that by matching the flexibility and relative position of the struts in the wing material to the loads placed on it, it can passively and automatically reconfigure itself into the needed form. And that’s amazing. The first version of the new metamaterial was made by hand using water jets to produce each tile in a matter of minutes, but a new injection molding method has cut this down to 17 seconds. 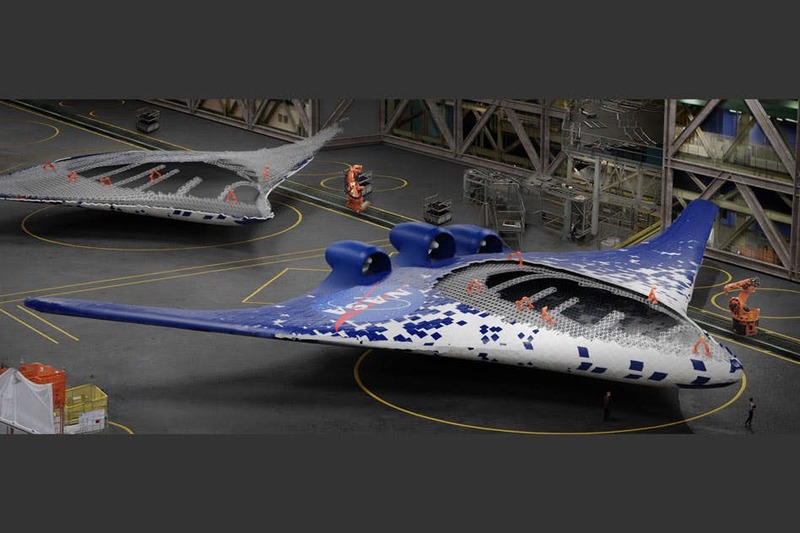 By combining this with robotic assembly, it will be possible to not only scale up the system while keeping down costs, but it will also free up engineers to use more efficient aircraft designs, such as a blended wing where the hull and wing meld into one another. In addition, the system could also be used to build large wind turbines on site or for manufacturing structures in space, and much more.